If there is any figure that can so fittingly be described as equal parts man, myth and legend, it is the figure of King Arthur. While his actual existence continues to be debated, with most scholars leaning towards the conclusion that such a monarch never actually existed, the Arthurian legend has been a defining one that continues to shape popular culture and societal mores across the world today. King Arthur was supposedly a fierce warrior king of modern-day Britain, who, in the 5th and 6th centuries, succeeded in defeating the Saxons and unifying his kingdom, extending its reach into France, Iceland, Ireland, and Norway. More fanciful than these impressive geopolitical victories were the myths and legends surrounding Authur that most of us know well today. Who among us is not at least vaguely familiar with the Knights of the Round Table, the Sword in the Stone, and the Holy Grail? Real or not, the legend of King Arthur has endured for centuries, and has played a critical role in the formation of the English national myth, as well as in high and low culture across Europe from the medieval period onwards. King Arthur was and remains one of the most iconic cultural figures in human history, with the Arthurian legend continuing to play out across our screens, books, magazines, games, slot machines and stages in 2018. Here’s everything you need to know about this quintessential figure of English and European history. The earliest known recordings of a figure known as King Arthur date back to around 828 with a work by the Welsh Monk Nennius called Historia Brittonum. 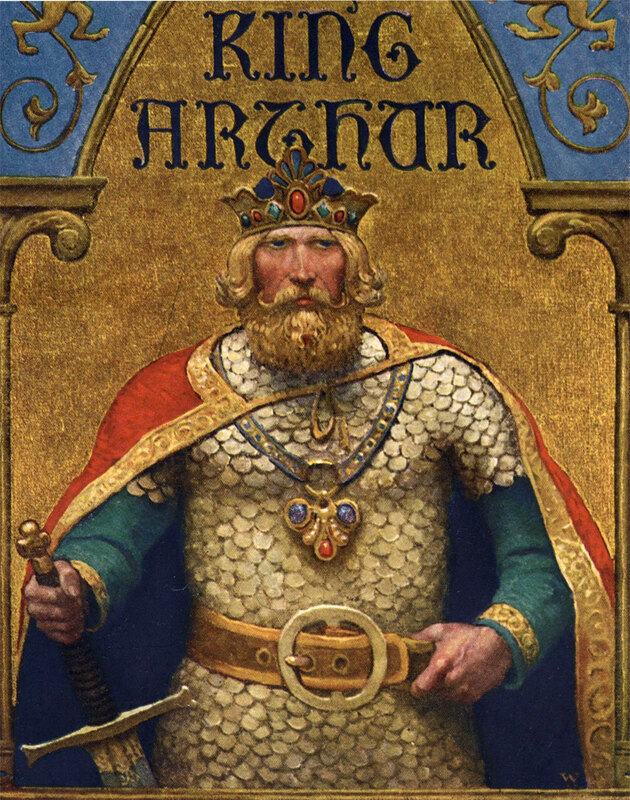 In it, Arthur is depicted not as a king, but as a famously ferocious warrior knight who helped defeat early invaders of Britain in a series of 12 battles. The work is one of the earliest attempts to comprehensively describe a history of the people of the British Isles and is one that is largely free of myths, thus lending credence to the idea that Arthur was a real historical figure. After this work, the legend dropped off the airwaves for a few hundred years, resurfacing again in the 12th Century as the central figure n Geoffrey of Monmouth’s Historia Regum Brittaniae, a pseudo-history of Britain which first introduced the characters of Merlin, Guinevere, and the legendary sword Excalibur. While this extensive work has been roundly debunked as a piece of pure fiction, the work flourished throughout Europe, particularly in France, where many of the most famous tales of Arthur then began to surface. The legend remained a focal point of medieval romantic literature, being referenced by real-life kings, queens and knights in reference to contemporary political upheavals, not least the devastating Wars of the Roses which predated the Tudor Dynasty. Following a lull in interest, the legend of Arthur again rose to cultural prominence during the Victorian era, as a newly confident Great Britain was spreading its influence around the globe, and patriotic citizens revived Arthur as a symbol of English greatness and superiority. Since then, Arthur has well-and-truly entered the annals of global culture and is recreated in various media around the world on an almost daily basis. In the modern era, King Arthur symbolizes many things. Arthur and the central cast of characters such as Lancelot, Gawain, Merlin, and the rest are closely associated with adventure, chivalry, bravery, risk-taking and fantastical magical creations. This is partly what makes King Arthur such a popular figure in contemporary culture, one that the public continues to enjoy watching, reading and singing about. The legend has proved a reliable box office draw, spawning several iconic film and television titles. The most famous include the classic Monty Python comedy Monty Python and the Holy Grail (1975) which satirizes the legend to great effect. Then, there’s the 1981 Hollywood epic Excalibur, and the 1967 musical Camelot, which covers the love triangle between Arthur, Gwenevive and Lancelot. On television, the high-budget BBC series Merlin managed to draw in millions of viewers every week, demonstrating that the appetite for Arthur has not waned. Beyond film, Arthur has been depicted in every other media imaginable. There are bestselling video games allowing you to follow his legendary exploits, such as a hugely popular online RPG hosted on Steam, and a 2004 Playstation title based on a film of the same name released that year. His image and legend have also made their way onto online casino games, with the popular Avalon slot game on Betway allowing players to win real money in pursuit of the Holy Grail. The legend of the sword Excalibur is the focal point of one of the highest-selling games of all time, Tomb Raider Legend, in which Lara Croft traverses the planet in search of this artifact. King Arthur has also been depicted in comic books, with his role in the DC Comics universe being one of the longest-running of all-time, having first appeared in 1936, thus predating the appearance of both Batman and Superman. Just a fleeting glimpse at contemporary culture is enough to persuade you that Arthur isn’t going away anytime soon. His popularity is no longer tied to ideas surrounding British exceptionalism or French romance but is instead tied to enduring beliefs in the importance of adventure, brotherly friendship, bold pursuits of love and happiness and, most importantly, the idea that one should always carve out their own path in life. It is for these reasons that Arthur will endure for a long time still.